Rig your kayak like a pro with our ProStaff Complete System! It includes our patent-pending Power Panel electronic control system, our Power Pack Battery Box (batteries not included) with master power switch and integrated USB charging, three Power Ports (bow, mid-ship, stern) with Power Plug accessory connectors, our complete 4-piece green LED light kit, 2-piece blue LED interior button lights and our waterproof remote control module. Whether paddling, standing up, fishing, wade fishing, night fishing or just showing off, this system is everything you need to transform your kayak into a full-featured electronic fishing machine! Connecting is all together is quick and easy, too, with our plug-and-play connectors. 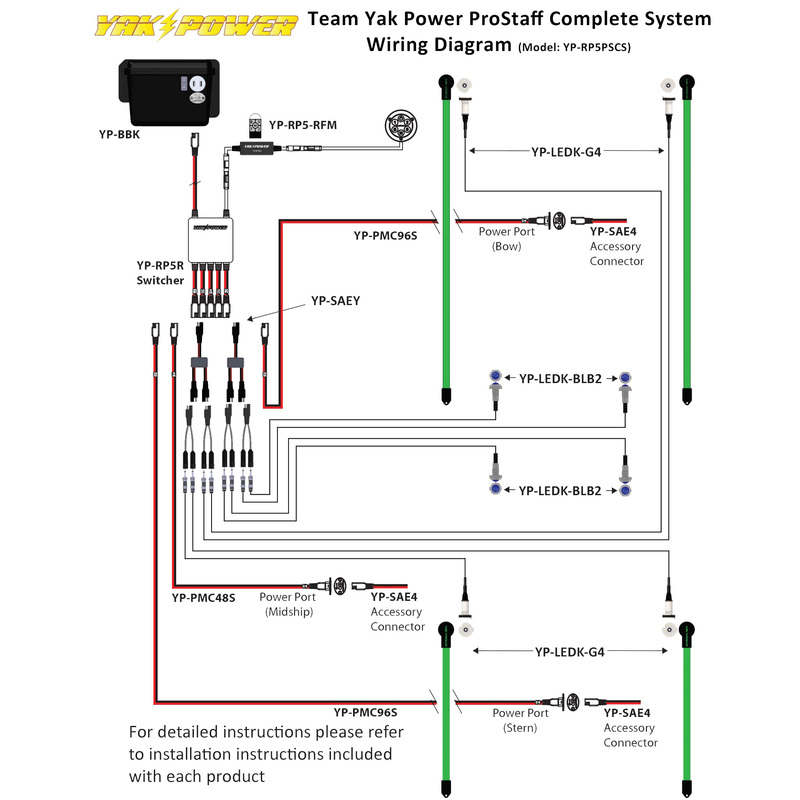 Note: Yak-Power uses our own custom tooled, high tolerance, very snug fitting connectors with larger gauge, real copper wire to ensure a quality, weatherproof and reliable connection. All our plug-and-play accessories are specifically designed to work together while maintaining the correct battery polarity throughout the entire Yak-Power system. Using other aftermarket connectors or splicing other connectors into the YP system may cause damage to the system or the accessories connected to the system and may void your warranty.